Does Google Split or Stem Anchor Text? Home > Google News > Google SEO > Does Google Split or Stem Anchor Text? A HighRankings Forums member wonders how Google treats his keywords since some of the backlinks pointing to his site do not have spaces despite the fact that the phrase consists of multiple words. Due to the long name of my website (keyword), a couple of my backlinks are anchor text as thisisme, instead of this is me. Just wondering, does google see the backlink anchor text as 3 words too? Many people think that the answer to this question is no. As one of the members puts it, "There is no way for google bot to segregate out the words thisisme." The discussion turns to how Google handles multiple words (splitting or stemming) within a keyword phrase. The idea is that Google will stem keywords, which means that they will add appropriate suffixes to keywords when they are being searched upon, but there's no evidence to promote the conception that Google is actually splitting keywords in a search term. Word splitting is a whole other matter. I've not seen any evidence suggesting any of the engines attempt to split words. Especially if the root word isn't really a word. That should mean that if you search for "thisisme" on Google, you will probably find the desired result, but if you search for "this is me," you probably won't. Why would ANY search engine do word splitting as returned results??? It really would be wasted processing power. what if a user types in redfordcar? do they want results for "red ford car", "redford car" (as in a search for a car in Redford) or are they looking for redfordcar?? The software engineers cannot afford to second guess what the user wanted, that way would lie disaster for the SE in question. As an example, I did a search for Stumble Upon but saw the typical "StumbleUpon" results. 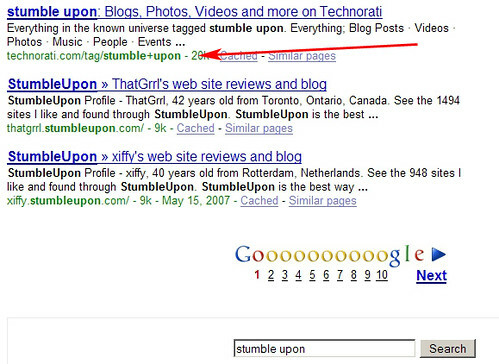 However, on the front page, I saw a result for the Technorati tag "stumble upon." When I did the same search for StumbleUpon without the space, the Technorati tag with the space was nowhere to be seen within the first 100 results. Here's a screenshot of the "Stumble Upon" search on Google. The first result with the space showed up in position #8. As you can see, Google is ranking the Technorati listing that contains a space in the title and URL and description of the phrase "stumble upon" in the top ten for a search on stumble [SPACE] upon. But the same page does not rank for a search on "stumbleupon," without a space, in Google. This may support the theories above, but in the same case, we do not know exactly how Google handles these situations. Forum discussion continues at HighRankings Forums. Previous story: Pages Ranking Poorly in Yahoo Search But Well in Google?